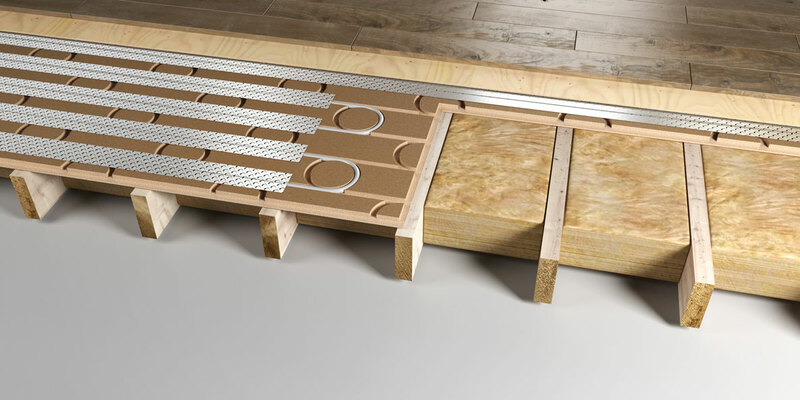 The Stuctural in-floorboard underfloor heating system designed by Base is ideal for low build up applications. It is load baring and is one of our best solutions for a joisted ground or upper floor. BaseTM structural in-board underfloor heating system. PEX pipe installed to pre-routed 2400mm x 600mm x 22mm tongue & groove panel. Panel glued and screwed to 400mm centre joists. 6mm engineered timber panel installed to tongue & groove panel.